The Flash remains, in my humble opinion, the best superhero show to hit the airwaves in years. As we’re getting into it’s second season, it continues to be enjoyable. And this plotline involving Earth-2 has some great potential. But, that being said, this week’s episode was underwhelming. Sadly, much of it has to do with Jay Garrick, our Flash of Earth-2. 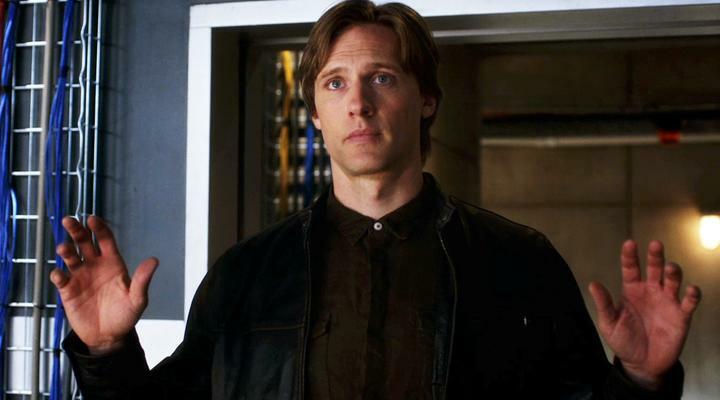 Teddy Sears does his first full episode as Jay Garrick. This isn’t Teddy’s first time around the block, but he was pretty wooden in this episode. He’s got a good look, but I don’t see a lot of chemistry between he and Grant Gustin or Danielle Panabaker. But of course, this is only his first episode. Let’s give him some time to get comfortable in the role. And let’s hope he gets it quickly. For obvious reasons, it’s looking like Jay is going to be a big part of this season. Jay also needs to stop calling Barry “kid.” You’re The Flash, man. Don’t be condescending. Shantel VanSanten plays Patty Spivot, a cop dying to get on Joe West’s metahuman task force. Very happy to see a new love interest for Barry. Patty Spivot is also his love interest in the comics right now, if I’m not mistaken. Obviously Barry is going to end up with Iris in the end. But I’ve always found Iris to be extremely annoying. There’s nothing wrong with how Candice Patton plays the part. But to me Iris has always been written very whiny and irritating. That’s why I’ve consistently rooted for Barry to end up with Caitlin. But Patty Spivot works too. Shantel VanSanten was charming in the role. She’s a welcome addition to the cast. Cisco tells Professor Stein about his visions, makes him promise to keep it a secret. Stein appears to have a seizure near the end of the episode. Cisco’s logic in telling Stein keep his mouth shut about thing makes no sense. He wants these awful visions to go away, but he doesn’t want Stein or anyone else to help him? From a drama standpoint, tt would have made more sense if Stein had his little episode as he and Cisco were about to confide in the rest of the team. Just my opinion. Also, that “I get a vibe” line was nice a little wink. Zoom recruits Eddie Slick, a.k.a. Sand Demon, to kill The Flash. Sand Demon is one of the few comic book super villains I’m not familiar with, but Kett Turton did fine playing a bad guy. Still, I couldn’t help but see him as a poor man’s version of Marvel’s Sandman. 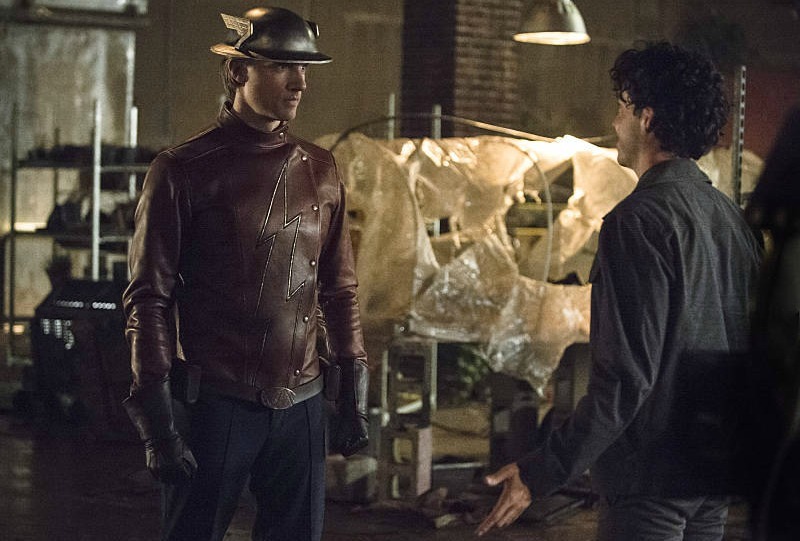 Based on how his fight with Barry and Jay ended, I’m wondering if we’ll see him again, as we did with the various villains last season. The episode ends with what appears to be an alternate-Earth version of Harrison Wells. So…is that the real Harrison Wells? Or is that future Eobard Thawne disguised as Harrison Wells? Also, was that Earth-2? Regardless, this could get messy. Image 1 from designtrend.com. Image 2 from thegg.net. Image 3 from bamsmackpow.com. This entry was posted in Television and tagged Barry Allen, Caitlin Snow, Candice Patton, Cisco Ramon, Danielle Panabaker, DC Comics, DC Entertainment, Grant Gustin, Harrison Wells, Iris West, Jay Garrick, Kett Turton, Martin Stein, Mrs. Primary Ignition, Professor Zoom, Rob Siebert, Ronnie Raymond, Sand Demon (DC Comics), Teddy Sears, television reviews, The Flash, The Flash (TV Series), The Flash of Two Worlds, TV, TV reviews on 10/13/2015 by primaryignition.